Experienced in the dueling piano circuit, Mark is a master at playing requests and loves interacting with his audience. He is a versatile singer-pianist specializing in popular music of the past 50 years. 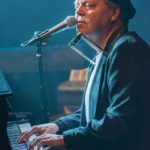 His repertoire includes hits from such classic artists as Billy Joel, Elton John, Frank Sinatra, The Eagles, James Taylor, The Beatles, Neil Diamond and others. He was a music teacher in the Burnsville schools for over 30 years.